I'm thrilled to have this small hooked rug from days of old!! It reminds me of the old Magdalena rugs. Some of the hooking is gone but I love it just the way it is! 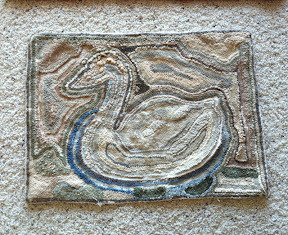 It's backed with an old feed sack handsewn to the rug. I'm thinking of recreating it into a pattern for my fall shows! This one is not as old but it's in perfect condition and has great color! 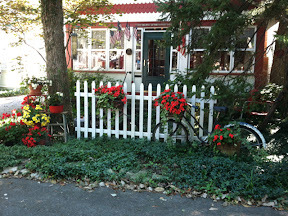 Lakeside is such a charming little place ~ it's a Methodist Chautauqua ~ very quiet and picturesque. 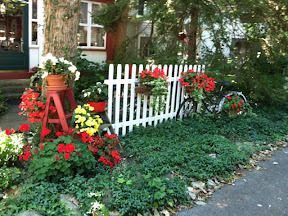 This little vignette is across the street from the show and I love seeing how they plant it every summer. There are still lots of Sauder pix to post from our class and the show! And pix from a fun class I took this past Wednesday. I'll try to catch up!! 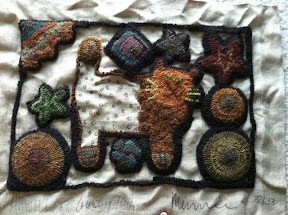 This is four days of hooking ~ love this rug! We had the best time ~ love teacher Lucille Festa! I will post more later but we are at the lake now. Off for our annual Put-in-Bay day with our lake friends!!! Just a quick post of rug pictures. Today is the last day of class and then I'm heading to the lake! We check out of the Sauder Inn this morning (which is a wonderful place to stay) and then pack up the wool mess that I made in the hooking room. Actually, I neatened up (is that a word, i wonder) last night before I left the hooking room. After dinner, we go back and hook and eat cookies ~ Sauder has a great bakery on site and there's a little display in the lobby for our snacking pleasure! One sweet friend drinks scotch!!!! We have the best time and there's lots of gals stopping thru in the evening, that it's one long gabfest!! If you double click on the photo, you can get a closer look. Again,I took these with the iPad ~ not as good as my phone pix! But enjoy, anyway!! That's it for today! We've had a fabulous time here ~ if you at all have the chance to come to Sauder next year, make your way to western Ohio! Such a fun inspiring time!! The Presidents is one of the featured displays at Sauder Rug week rug show! Nola Heidbreder hooked all 44 Presidents over this past year! Nola is a rug hooking teacher from St. Louis and is a bundle of energy! She has done a wonderful job capturing the essence of each of these men! I had trouble with blogger in the middle of the post ~ there is more to add about Nola and her sister, Linda Pietz, who did the knitted versions of the Presidents ~ I will edit it when I get to my computer!! At any rate, enjoy the photos!! This was one of the special displays at the Sauder rug show today ~ antique hooked and stitched rugs. Beautiful ~ every one! I especially loved seeing this rug in person since I've hooked Barbara Carroll's version of it! It's a great rug! So beautiful even now. Some of these rugs date back to the 1800's. LOVE this rug in person! 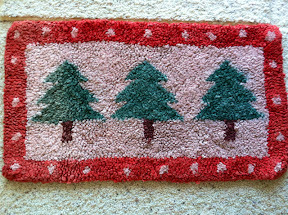 Wool appliqué with lovely color still. This is stitched and appliquéd. Gorgeous color in the bottom rug. Two versions of the same pattern. Contemporary rugs done by Tracy Jamar ~ very creative! Tracy and Jan Whitlock authored this book and were there this evening autographing our copies as we purchased! I've only skimmed thru it but I can tell its a great history of the sewn rug and one we'll use as a reference for a long time to come! Our first day went fast ~ the rugs are beautiful,if you get a chance to be here this week ~ the vendors have lots for you to buy ~ and I'm thrilled to get a bolt of SPARKLY wool that I'm going to dye for my next show!!! More to come ~ stay tuned! P.S. ~ the authors asked me to remind everyone that most of these rugs are covered under the copyright law! !